As your business goes grows globally, so do your needs to communicate with international customers. You may be struggling to understand your customer demands because there is a language barrier that is preventing complete and understandable communication. Using interpreter services can actually help your business connect with consumers located all over the world. With interpreter services, you can travel to your international customers’ locations in confidence knowing that you will be able to understand the language without difficulty. An experienced interpreter can help you navigate a foreign land and make sure your client fully understands the message you are trying to convey about your products and services. Even specialized businesses can benefit from interpreter services as they can provide you the ability to communicate without in a language that you both understand. Many interpreter services have expert linguists that are able to translate complex and technical information with ease. They can help your customer understand the details that you are looking to communicate that can often get lost when your language is not their native tongue. Working with interpreter services can help you partner with international clients and close those deals quicker as you are both able to understand the nuances of the transaction. When both parties are on the same page, it is easier and more effective to move a deal along. There is no need to wonder if your client fully understands the services you are providing or if they will hold up their end of the bargain. Your customers will appreciate that you went to great lengths to offer interpreter services that cater to their language needs as well as yours. When you hire an interpreter, your business will benefit by having a more professional reputation. Trying to fumble your way through an international language conversation is no way to operate your company, and it can only leave your customers confused and angry at the lack of communication on your part. Having interpreter services that can translate your conversation as well as your clients can ensure that there is no misunderstanding. It can improve your ability to better serve your customers and allow you to align forces together to reach the same goal, regardless if you speak the same language. An interpreter service can provide a translation of any language by a qualified linguist. They will be by your side as long as you need them and can prevent miscommunications that can turn a client off based on their regional dialect. Don’t risk the reputation of your business by working with international customers without interpreter services. The lack of support and communication that you will display will portray your business in a negative light and prevent you from making the outstanding first impression with your customers. 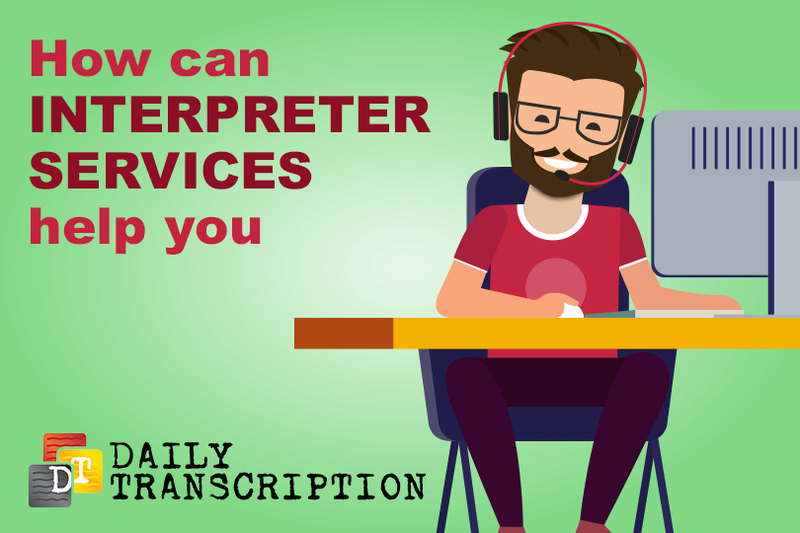 When you need interpreter services that you can count on for your business’ international clients, turn to Daily Transcription. It has a team of linguists that are ready to assist you with your translation needs, so your company can succeed in a global environment.